This past week brought some changes to Estero Bay and Fort Myers. We had a cold front move through our area in the middle of the week which definitely affected the fishing opportunities. By Saturday and Sunday the weather started to warm up and the fishing picked up a little too. We had some challenging conditions to deal with, first was the fact the full moon was this week,and second was the fact that the higher stages of the tides were in the middle of the night. Whenever this happens the fish tend to feed heavily at night, making it slower fishing during the day. On Saturday there was also a negative low tide to deal with making it even more challenging. 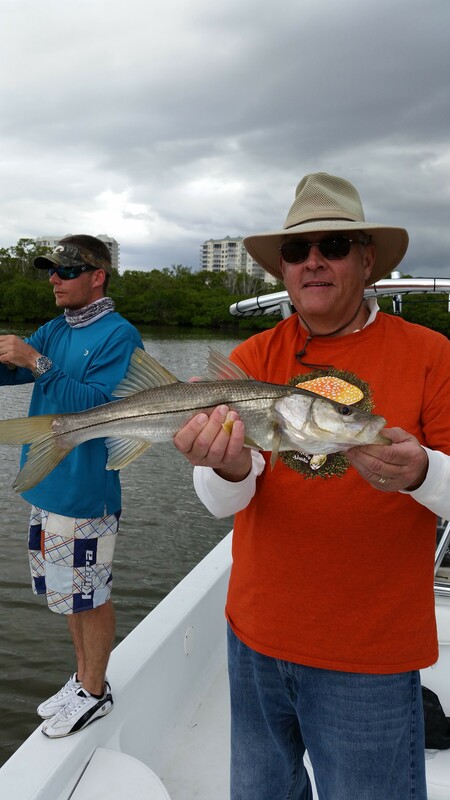 We managed to catch Redfish Snook Jack and Sheepshead though and all in all did fairly well with what we were given. If you are going to go fishing this week wait until the afternoon to make your trip. The mornings with low water and wind are not producing right now. However when the tide changes and comes in for a while your luck will turn around. I used both shrimp and Pilchards for bait, oddly enough on Saturday we caught more on Shrimp and Sunday we caught more on Pilchards. Sunday was warmer than Saturday and another day removed from our cold front, that’s what i attribute to the change in the fish behavior and their preference in bait. Either way load up on both and be ready for whatever presents itself. This week we will get another cold front but this one will linger a few days, its not always bad when this happens because the fish can get in to a pattern and somewhat used to the change. Look to fish the far back canals and creeks as that’s where the fish tend to be this time of year in general.